Puberty is also a time when voices turn fuller and more adult. The voice box (also known as the ‘larynx’) grows during puberty in both boys and girls. Believe it or not, several hormones change the voice, including estrogen (E) and testosterone (T). 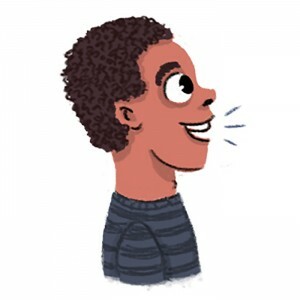 T can help grow the folds of the voice box, resulting in a deeper sounding voice. You may notice that your voice box bobs up and down when you talk. This is called an Adam’s apple. Some guys and even girls have really big ones, some have little ones, and others you can’t see. Each one is different. If you don’t have much T or don’t react to it, your voice is likely to get fuller and become a little lower in pitch. If you have T and can partially react to it, you might experience changes in your voice; it might get deeper as well as fuller. It also might get much lower in pitch. If you do have lots of T and can react to it, your voice is likely to change by getting deeper, fuller, and lower in pitch. You may also develop a bit of an Adam’s apple.